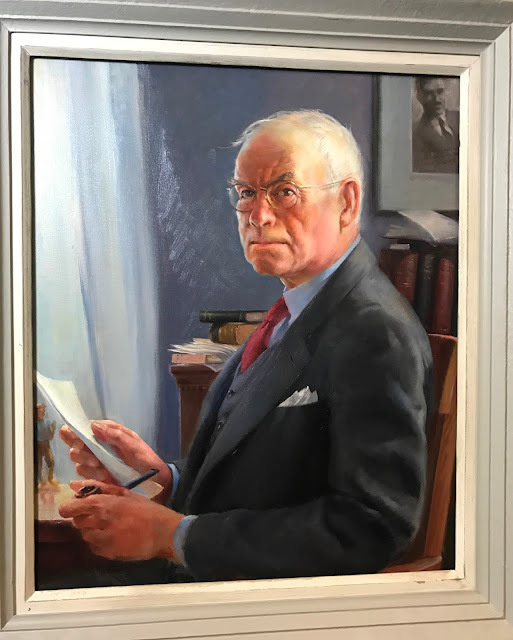 The staff at the National Portrait Gallery have been wonderfully supportive of our efforts to learn more about Francis Quirk's portrait of Edgar Lee Masters. In addition to providing images, they have allowed us to visit their archives building to see the painting up close. The archives are kept in a very plane looking warehouse type building in the suburbs of Washington D.C. As we pulled up, I hinted to my sons that we might find the Lost Ark of movie fame inside. While we did not find Indy's treasure, we did see others; reaffirming my conviction that Museums have an opportunity to bring art lovers closer through tours of the archives. After signing in, Todd walked us through a labyrinth of clean hallways, past a photographic set-up and into a bay containing a myriad of paintings and sculptures. The Edgar Lee Masters Portrait was set up on an easel. Its strength was immediately apparent. Below are some close ups of key areas including the face, hands, and the Quirk Self-Portrait. Beyond the excellent execution, one of the most interesting features of the painting is the self-portrait that is in the upper right hand corner. Quirk has included an inscription to his friend- "In Fullest admiration to Edgar Lee Masters Francis J. Quirk."